Traditional Mexican Christmas Celebrations "Posadas" and "Pastorelas" in "San Felipe de Jesus" barrio in Barra de Navidad, Jalisco organized by Doña Petra and neighbors. This event is free but donations are welcome to the church or Doña Petra the organizer of the Posadas. There are also Posadas around the different Barra de Navidad neighborhoods Dec. 15 - Dec. 24. "Las Posadas" officially begin on Dec 16th when the Nativity Scene is set up in most of the houses in Mexico, and the last posada is on Dec. 24th. In a traditional Posada the Rosary is prayed and images of Joseph and Mary are taken on a pilgrimage by the "peregrinos" (pilgrims) carrying candles and "bengala" lights and singing the traditional songs looking for a place to stay where Jesus will be born.During the pilgrimage Joseph and Mary are rejected until they are finally allowed in a place where Jesus will be born. A piñata with seven cones (that represent the seven capital sins) full of candies, oranges, mandarins and sugar cane pieces is broken and bags with colaciones (special type of candy for posadas), cookies, oranges, mandarins, sugar cane pieces and peanuts (bolos) are given to all the attendants. Posadas can be organized by families, friends, neighbors, churches, companies, etc. "San Felipe de Jesús" barrio in Barra de Navidad celebrates these beautiful traditions in the most authentic way thanks to a group of neighbors led by Doña Petra. In this case they organize a combination of Posada and Pastorela. 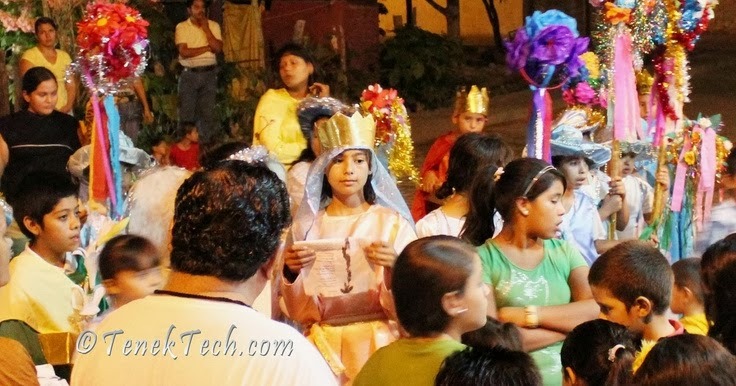 Enthusiastic children dressed up as Joseph, Mary, shepherds, the Wise Men (Reyes Magos), angels and devils including "luzbel" (lucifer) gather in the church of the Barra de Navidad barrio where the Rosary along with Christmas songs is prayed around 7:00 pm. After the Rosary children and adults walk in a parade singing Mexican Christmas carols toward the street where "la posada" takes place. All the attendants to the "posada" participate singing the verses of the reenactment of Joseph and Mary looking for lodging (see below songs to ask for Posada). They also sing lullabies for Baby Jesus in the part known in Mexico as "acostada del Niño Dios" (bedding of Baby Jesus). A piñata is broken by the children and to finish an appetizer is served (pozole, tostadas, tacos, etc) and children are given "bolos" bags with traditional Mexican Christmas candies and cookies and also fruits. Mexican Christmas Traditions - Las Posadas - Ready to break "la Piñata"! !